What is movement? Where does it come from? Human movement patterns include but are not exclusive to – running, jumping, swimming, crawling, rolling, pulling, lifting, twisting, inverting and climbing. In this blog post I will reverse engineer movement and trace it back to its neural origins. I will explore concepts of movement efficiency, body intelligence, visualization, play and the integration of these elements. In neuroscience, movement is often studied in terms of either motor disorders or the development of artificial intelligence for robotic or prosthetics. However, according to a leading neuroscientist at the University of Cambridge, the real reason for the complex development of our brain is to generate movement itself. Most of our movement is essentially hardwired and we end up moving in stereotypic patterns. However, beneath the surface of mundane, everyday movement, a well refined network of neurons are working at a technologically unmatched precision. For example, the simple act of pouring water out of a jug into a glass requires sensory motor integration where the visual/proprioceptive input we are receiving is updating our motor output so that the jug remains at the same spatial location, despite the jug decreasing in weight. At a neuromuscular level, movement essentially follows two pathways – Feed forward or Feedback. The feed forward pathways updates the movement in realtime. For example, when catching a ball, there are predictive changes in muscle activation before the ball hits the hand in order to compensate for ball weight and trajectory. These predictions are necessary because the visual-feedback system has a latency of about 200-300ms which is often too slow, for example in a game of tennis. The feed forward system works synergistically with the feedback loop to update the motor commands based on past experience. Such is the extent of our adaptive motor learning mechanisms. Movement efficiency is often examined bio-mechanically. However, I will spare a kinetic evaluation of movement. Instead, I will explore movement efficiency in terms of softening the body to make movement frictionless. In most fitness workouts, training is done under neuromuscular stress. We often tend to hold our breath under stress, thus the muscles are working under hypoxic conditions. I suggest experimenting with your pH levels before and after exercise – Regardless of the blood buffer levels, exercise causes net acidosis. Breath is a crucial element as a first step in any movement program. When there is no coupling of movement with breath, movement can hold tension and become corrosive in nature. Synching with breath can induce dynamic relaxation in movement, remove the element of stress and can in fact counteract the corrosive nature of movement. In this manner, you can get rid of “rest days” from your movement program, drastically reduce injury and ultimately heal the body through movement. Another crucial element in movement is the use of body intelligence, also known as intuition or instinct. Far too many fitness programs focus on correcting posture and the “right technique”. However! inbuilt in every human body is an intelligence far greater than what is written in sports science literature. This intelligence is stored in our subconscious and often emerges in states of flow that is induced by fear or trance. The flow state is described as the merging of action and awareness. A state where you are fully immersed in the enjoyment of the process. Today, most of our movements are mindless, requires effort and often riddled with injuries because we have linearized our workout programs, forgot about the body’s natural ability to auto correct our movements and designed movement to be goal oriented towards aesthetic beauty. We aim to loose weight, have tight abs and gluts and have become blind to the beauty of movement itself! By unlocking the subconscious, we gain access to the vast plethora of body intelligence. This includes such things as tactile sensitivity. For example, by wearing well cushioned shoes, we have deprived ourselves of the enormous amounts of information available from the terrain. By becoming receptive to our senses, we gain a heightened sense of awareness, a focus, a trance that propels us into a state of flow. We begin to experience the flow state in even the most ordinary of movements – which suddenly makes every movement a rewarding experience. The art of visualization goes hand in hand with the flow state. Primitive cultures have used visualization for hunting, which is a process that it unique to humans alone. Visualization allows us to engage a complete sensory experience without performing the action itself. The powerful nature of visualization has been exploited by professional athletics such as gymnastics to visual complex movement maneuvers. The great advantage of visualization is that you cannot fail. Personally, I remember that when I was doing brain surgery work for my Masters Degree in sensory motor learning, I would visualize the whole surgical procedure to the minutest movements and sensations so that when I did the surgery in real life, every step of the surgery flowed seamlessly and free of absent-minded mistakes. Play is a natural feature in our animal lineage. Play induces inventiveness and creativity. Play brings with it fascination and curiosity. Play is our adaptive wildcard and is the hallmark of learning. The reason play is so effective as a learning mechanism is because the concept of mistakes are nonexistent. This is the biggest reason why children are able to learn at rates far more rapid than adults. Needless to say movement has an avalanching effect on mental health. Symptoms of mood morbidity are often of a sedentary nature – the lack of play. The less you move, the closer you are to death! Through, breathe, body intelligence, visualization and play, we begin to genuinely explore the remarkable capacity of the human body. 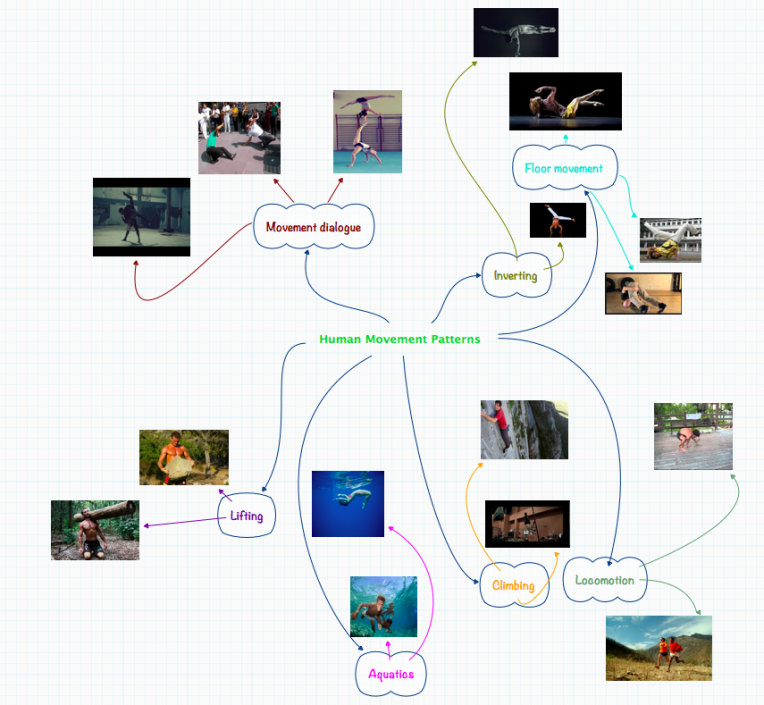 We begin to synthesize complex movement patterns, or movement clusters – a term that I have coined. Each cluster of moves forms a movement language. For example, floor-work from systema, jiu jitsu, capoeira and contemporary dance can form one movement cluster. Different locomotion patterns can form another movement cluster. The integration of these movement languages forms a network of movement patterns (as shown in the picture below). I searched all over the web for something like this but wasn’t able to find anything documenting human movement. So here is my graphical representation of human movement patterns. Each movement cluster is color coded for convince. The body remembers what we are – the force of nature is in our basic instinct.